The Soviet Union began the space race in 1957 but the legacy of Russian astronautics dates back to the 19th century. A long list of accomplishments places the Russian people in the vanguard of space exploring nations. 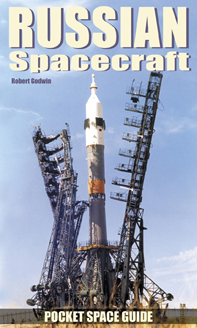 From Sputnik to Yuri Gagarin through to the International Space Station this book covers the history of Russian spacecraft in great detail. Complete with photographs and drawings from Russia's "Rocket and Space Corporation Energia", this "Pocket Space Guide" is a condensed history of the Russian Space Program from 1946 to the present day. Fifteen years after the founding of the program, in April 1961, Russian cosmonaut, Yuri Gagarin became the first human to fly in space, and the race was on. Fabulous spacecraft photos and facts illustrate and authenticate this authoritative history. Apogee has done it again with this marvelous pocket guide to the Russian space program. From the Soviet-era moonships (with great cutaway artwork) to the mighty boosters and the trailblazing space stations, it's all here in one authoritative, well-illustrated volume. What a neat book!